CES 2018 Starting Tuesday January 9 -12. See all the latest technology innovation with Don Baine,The Gadget Professor. Tune in here at www.thegadgetprofessor.com or www.facebook.com/TheGadgetProfessor to see it all “LIVE”. Welcome to The Gadget Professor Show #336 hosted by Don Baine. LF 360 Cam – 360° and 180° image capture with one click.Capture the world around you in all directions with the LG 360 CAM Spherical Camera. This camera uses two 13MP sensors along with two 200° wide-angle lenses to capture photos and 2K video in 360°. Three microphones record 5.1-channel surround sound. 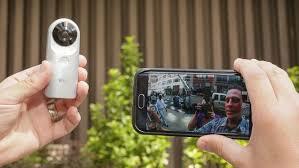 Media recorded with the 360 CAM can be uploaded to Google Street View and YouTube360, and are also viewable on the LG 360 VR as well as smartphones and other devices capable of displaying 360° content. It Cannot be activated without external memory inserted. The 1200mAh battery lets it run without a power source. Supported on Android 5.0 (L OS) or later, and iOS 8 or later. One Touch. 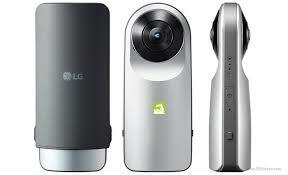 The LG 360 CAM lets you capture full 13 MP 360° photos and record 360° video in 2K. You can even use your smartphone as a remote control to see what you’re recording, in real time.